Indentification of this design as number 135 is original to Rakusan who designated this woodblock print as the 135th design published in his main sequence. However, 135 is actually the thirty-fifth and of thirty-six woodblock prints in Rakusan's second main sequence series, 篁子生画選, Koushisei Gasen, lit'Koushisei's Print Selection' usually called here the 36 Series). The woodblock print of 135 was adapted from an actual-size original painting on silk. All of the original prototype paintings for this series are currently in a single private collection. The Rakusan project which produced 篁子生画選, Koushisei Gasen, resulted in two related series of woodblock prints. Each print of the 36 Series is intimately connected to a group of prints with the same subjects in the Fan Series. Together these subject-related prints in the two series constitute a theme. Each theme typically consists of a quintet of monochrome Fan Series designs (one design in each of the five fan shapes), plus one polychrome, 36 Series design which illustrates the theme subject. The theme is labeled here by the original Rakusan number of its 36 Series design followed by the subject. 135 is the 36 Series design of the 135 Freshwater Fish theme. The 135 Freshwater Fish theme is one of the many entirely regular themes represented by a complete fan quintet and a color woodblock print. Four of the five Fan Series designs have seal C which indicates carving dates between the last months of 1933 and the end of the first quarter of 1934. The remaining Fan Series design has minor seal R whose carving period has yet to be established. The 36 Series design 135 has seal B which indicates a later carving period closer to the time of publication. The Fan Series and 36 Series prints of the 135 Freshwater Fish theme were distributed in early 1935 in the final installment twelve (of twelve). The delivery documents for installment twelve remain to be discovered. The series as originally announced would have seen this last installment published in December 1934. However, with documented delays the earliest month it could actually have been delivered is March 1935, and it may well have been even further delayed. Each of the woodblock prints in this theme would have been printed in the same month as their distribution. The Fan Series designs of the 135 Freshwater Fish theme are unique in that each has a title naming the illustrated species which is incorporated into the composition. However, 135 (like all 36 Series designs) has no original title, and what Rakusan chose to call this theme is unknown. Because a carp is shown in 135-4, Rakusan's preferred spelling of the name is known and is used in the title supplied here. 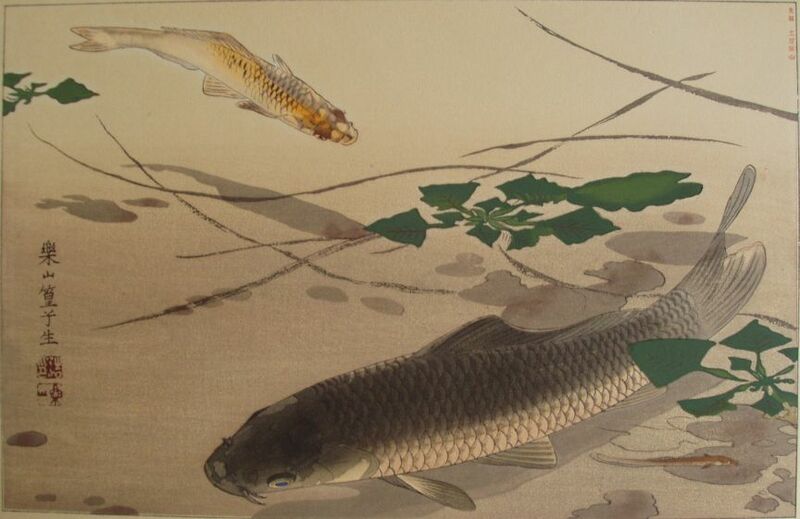 In 135 the shadows of the fish and of the leaves floating on the surface indicate that the water is both clear and evenly shallow, suggesting that the fish may be in a garden pond. Common (Eurasian)Carp, Cyprinus carpio, 鯉, たちあおい, コイ, koi, is an often raised species of freshwater fish. The Japanese name is used both for the wild and domesticated varieties. Like goldfish, carp were originally raised for food, and rare color and form mutants among the domesticated stock were selectively bred for decorative purposes. The English name koi is borrowed directly from Japanese only in the restricted sense of those decorative carp kept as pets. Carp is still eaten today including koi stock that does not meet breed standards for pets, but fish kept as pets are not eaten. Fancy koi varieties are also often called 錦鯉, にしきごい, ニシキゴイ, nishiki-goi, lit. 'colored carp'. Japanese Loach (Weather Loach, Weatherfish), Misgurnus anguillicaudatus, 鰌, どじょう, ドジョウ, dojou, is the small fish swimming in the lower right corner. Although found natively in the wild, loaches are popular and easy aquarium fish, and are also farmed for food. Lesser Water Chestnut, Trapa japonica, 菱, ひし, ヒシ, hishi, lit. 'diamond (shape)', is an aquatic annual plant native to Japan. It takes its Japanese name from its diamond-shaped leaves which float in a rosette on the surface of the water. It is closely related to other plants in the same genus called Water Chestnut and Water Caltrop (from the shapes of their edible seeds). Floating to the right of the middle of the three water chestnut rosettes is a single leaf of a waterlily (family Nyphaeaceae) which cannot be identified further. Also shown in the composition are wavy lines which, as in other designs in this theme, are meant to show that the fish are alive and swimming in water.